With styling inspired by aviator goggles, the Rapha Pro Team Flyweight Glasses feature world-class technical specifications. The Carl Zeiss lens – with the UV400-protective Neutral Grey / Bronze Mirror coming as standard, and five other detachable lens colours available to purchase separately – offers optical clarity in a wide range of conditions, while the extremely lightweight (25g), aerodynamic construction guarantees maximum comfort on long rides. The Italian-made lenses come with a protective treatment that makes them scratch resistant, anti-fog, easy to clean and ensures dirt and water won’t stick. Multiple frame arm colours (and one RCC-exclusive option) allow you to choose the glasses that best suit the kit you ride in. For regular use, in all-round sunny and bright conditions. Rapha offers six lens colours for the Pro Team Flyweight Glasses, each one suitable for different light conditions. 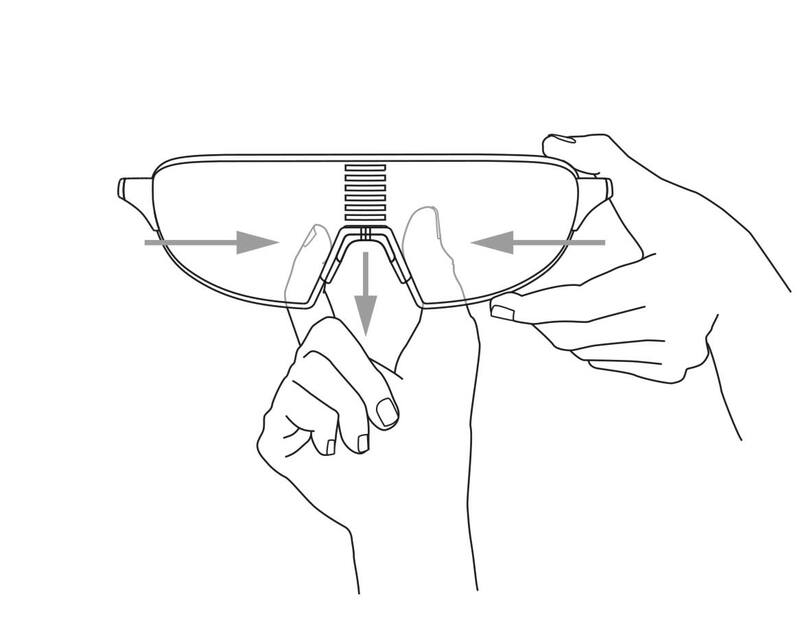 The glasses’ hard case has space for up to two extra lenses, allowing you to easily change according to the conditions. All lenses are made from lightweight and impact-resistant polycarbonate with oleophobic and hydrophobic coating on front and back and offer 100% protection from UV rays. Securely hold one arm of the frame and with the other hand grasp the top and bottom of the lens. Simultaneously pull the arm and the lens in opposite directions. Perform the same movement with the other side/arm of the frame. 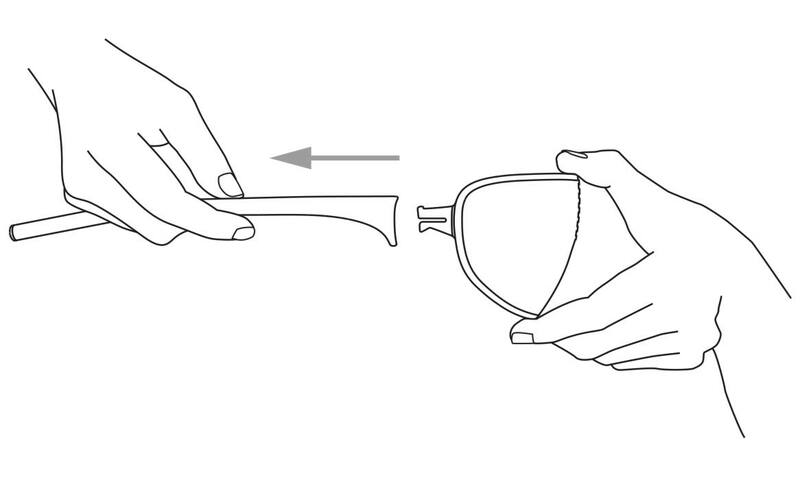 Pinch the lens with thumb and fore nger and with the other hand pinch and push the nose-bridge together. Slide it downwards away from the lens. With the replacement lens slide the nose- bridge back on. Reverse the procedure from steps 1 and 2 pushing each arm back onto the lens. Please contact a Rapha Customer Service operator for any fault or repair issue. Rated 5 out of 5 by ipdf10 from Great glasses Got these glasses a few weeks ago and was able to use them both in bright light conditions as well as overcast days. They work great in both lighting condtitions, not sure I would need another lens. The fit is spot on, along with all the great zeiss lens qualities makes this a great product. My other glasses are also a ziess lens product, so happy to have an alternative style. Only complaint would be that it would have been nice to have a hard case to keep them in, rather than the soft case they come with (could be easily crushed in) or the metal box they were shipped in (makes for a nice display, but impractical). Rated 4 out of 5 by Totalbser from Almost Fantastic The lenses seem to sharpen what you are looking at. The styling draws compliments from even the most hardened riders. Super light weight, which makes you feel like they are brittle, but they aren't. While the Bronze lens doesn't work in as wide a range as the Oakley Prizm, it looks better and certainly works well . I do have to change out for early am rides to the yellow lens and it's not really convenient to try and get your group to wait while you change lenses. Two negative nits to me: 1) Nose piece is tough to get back onto lens when you remove it to change out and 2) These fog a lot easier than others in the category. Rated 1 out of 5 by redspokes from Great but very fragile The glasses feel great, don't obstacle the vision at all, are super lightweight, but it has one flaw: both handles cracked after 2 months of careful use. I also have the yellow night glasses and they didn't crack, so it seems something is wrong with the material of the glasses. I hope Rapha will repair/replace it for me, otherwise I won't buy them again . Rated 5 out of 5 by Rik066 from They live up to the name! Bought this with a few gift cards I got for my birthday. Extremely lightweight, to the point you forget you are wearing them. Lens clarity is excellent. They do fog up some depending on the ambient conditions. Early in the morning in Chicago lately it is very humid (yes, shocking, I know) so when I stop for the occasional traffic light they do fog up. But then, what cycling glasses don't? I also bough the yellow and brown lenses. I need a lens with minimal frame. Much better field of view. If the lens rests on my cheeks I break out when I sweat (not cool). These fit the bill just perfect. Very pleased. Rated 5 out of 5 by Baldy Man on Wheels from Look Cool, Work Great I've only ever really worn Oakley's previously but basically these looked cool, so I thought i'd give them a go. They are: very light, almost too light... for the price you pay you want substance! Ignore the packaging they come in (metal tin) that's standard Rapha feel good peripheral stuff.. you can't wear the tin! But you wear the glasses and they fit well and give unobstructed vision (no thick arms or frame to get in the way), but the main reason you want these glasses is because you want to look cool on the bike and YES they do that job with aplomb! Rated 3 out of 5 by Andyv1 from Great glasses but one small flaw I've had the pro team glasses for about a week now, and I think they are great, my one only issue with them is I have cleaned them with the cloth provided (only cleaning fingerprints and the odd spec of dried water) and have found it has left very small smear scratches on the lens. Which is a shame. But still look good, don't know what they will look like after a years of use. are the hydrophobic etc coatings on both sides of lenses or just outside? Hi, the coating is on the outside, as on the inside it would reflect and damage visibility. I have these glasses with two lenses but looking for a case to carry them in when I commute. ; The square tin is decoartive but not for travelling. Do you have a product or what might you recommend? Hi, the tin box is the strongest as far as keeping the lenses intact. We do not have any other particular product we can suggest, only to be aware of possibly impact may they not be covered by a hard case. What is the fit like when used with a Kask Protone helmet? The helmet is a comfortable fit with a variety of different helmet styles and makes including Kask. I change lenses quite often, is the joint between the frame and the lenses sturdy? Do Rapha guaranty that this joint won&rsquo;t wear out with time? They are a lightweight performance oriented pair of glasses, so care should be taken when changing lenses however they are robust and we offer our usual product guarantees should you have an issue. So you know how the curvature of the lens and nose pieces might go with my flat Asian nose? 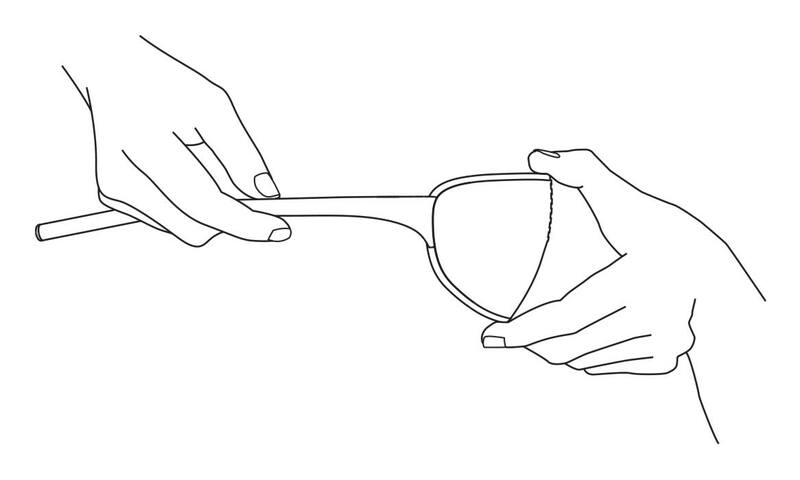 Hi, these glasses will fit an Asian face shape. They have replaceable nose pieces with two different sizes. Hi Rapha, please answer the previous unanswered questions regarding does the glasses fit Asian face? Hi, the glasses should fit an Asian face. Each pair also comes with two different sized nose pieces. If you still feel they don't fit/suit your own face, we do offer a 90 day returns policy. Hopefully that helps. Are the nose pieces on the pro team flyweight glasses adjustable? 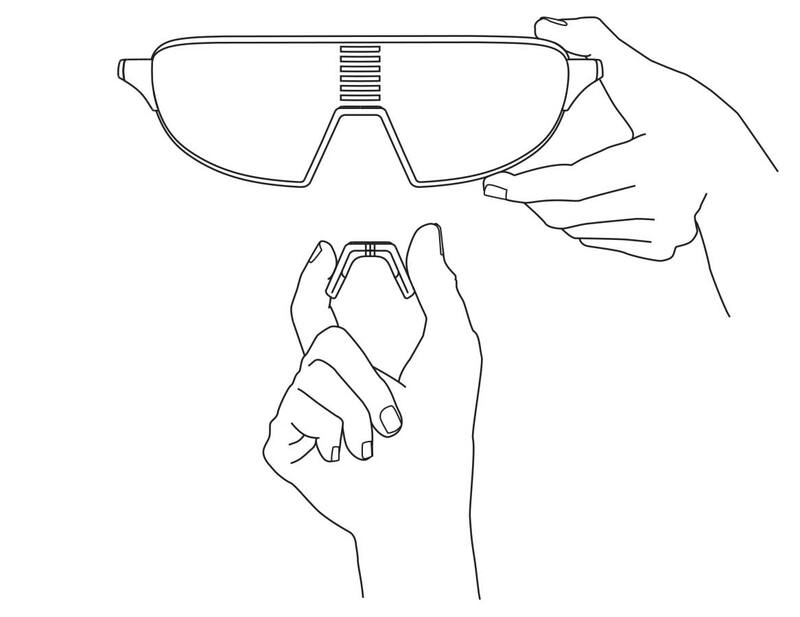 Hi, as mentioned in the product description, the Pro Team Flyweight Glasses come with detachable, replaceable rubber nose pads for multiple fits. Thank you for your request. We’ll contact you when your Pro Team Flyweight Glasses - Black/Bronze is available.